The Port Royal Club is located directly on the Gulf of Mexico at 2900 Gordon Drive, Naples, Florida 34102. Members enjoy fine dining, swimming, tennis, gym facilities, massage and facial treatments. Referred to simply as “The Club” by it’s members, the Port Royal Club was established in 1959 for the exclusive enjoyment of residents, their families and guests. The Club is open from mid-August until July, when it closes for a month. Property ownership in Port Royal is required for membership. 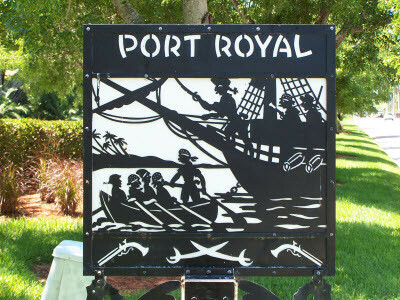 The majority of the homes and lots include membership privileges, but there are some home sites, although located in Port Royal, that do not hold the rights to apply for membership to the Port Royal Club. Membership is available to property owners south of 21st Ave South. Properties in this area are either eligible for Port Royal Club Resident Membership or Port Royal Associate Membership. The difference comes down to timing. Resident Memberships are immediately available while Associate Memberships may face a waiting list to join the Club. Only 57 Associate Members are allowed at a time. Resident Members must become a Member within 90 days of a home purchase. They can choose not to become a member and retain the property’s Residential Membership status by paying 25% of the initiation fee plus 25% of the annual dues. The Port Royal Club is a magical site for many area parties and weddings. The staff are experts at catering to guests’ needs and they create some delectable dishes that could be served in any five-star restaurant. The Friday night “Seafood Buffet” is one of the freshest seafood extravaganzas one could ever experience.